George Alfred Butler was born in San Francisco on September 13, 1911. He was the son of Alfred John Butler and Virginia Davis, the third generation of his family to live in the city of San Francisco. His father died at age 34 in the influenza pandemic of 1918 when he was seven years old. His mother remarried Andrew McKean and the family eventually moved to Vallejo, CA where he graduated from Vallejo High School in 1928. Both his parents worked in the shipyards at Mare Island. The economy of the town centered on those shipyards. His stated career goal was not to work in the shipyards. He entered college in 1929 at the College of the Pacific in Stockton, CA. With the onset of the Great Depression it took him eight years of intermittent work and study to graduate. He eventually earned a master’s degree in zoology with an interest in marine fauna. At the University of California at Berkeley he met Margaret Moore whom he had briefly known when both students at College of the Pacific. They married in 1940 and he took a teaching position at Vacaville High School. They lived in Vacaville for about two years before he entered the US Army in 1942. The Army was in desperate need of doctors and because of his science background he had nearly all the prerequisites for medical school. After a brief stint at University of Chicago to get missing physics classes, he was assigned to the dispensary at the Presidio of Monterey. In the dispensary, he worked with Edward Ricketts, a Monterey marine biologist, who was immortalized as “Doc” in John Steinbeck’s novel Cannery Row. In Monterey George and Margaret encountered the bohemian world of the poets, philosophers and artists who circled around Ed Rickets at the Pacific Biological Laboratory on Cannery Row. For most of World War II and to 1947 he attended medical school at the University of California San Francisco. Released from the Army after medical school, he took a position as the school physician for Santa Ana City Schools in Southern California. In September of 1950 the Fortieth Division of the California National Guard was called to serve in the Korean Conflict. After initial marshaling at Camp Cooke in Southern California the troops of the Fortieth Division embarked from Oakland and San Francisco for further training in Japan. 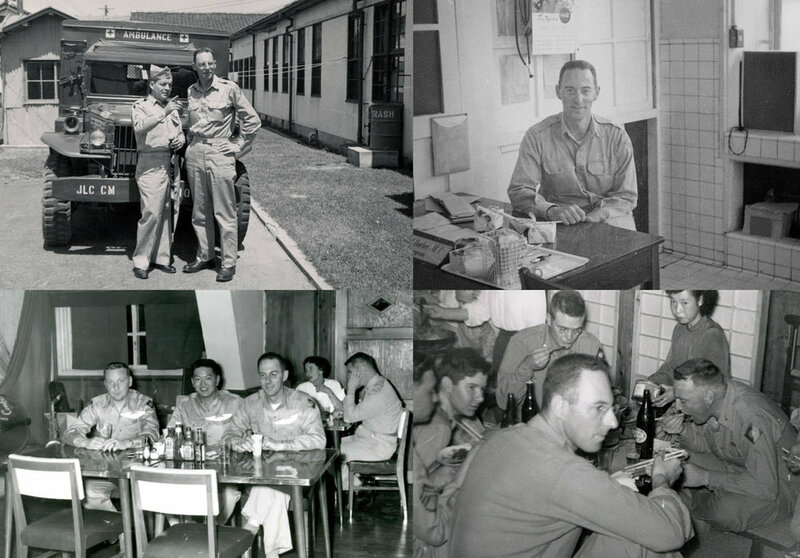 For nine months from March of 1951 to December of that year he was the Surgeon for the 578th Combat Engineering Battalion at Camp Matsushima near Ishinomaki, Japan. The Division shipped out to Korea in early January of 1952. After some months near the front lines in Korea he broke his ankle and was evacuated to a military hospital in Osaka, Japan. After his Army service George and his family, now with two children, Alan (1949) and Ann (1951), returned to Southern California. After some years again with the Santa Ana City Schools he began a Psychiatric Residency at the Norwalk State Hospital. In 1960 he took a position at Sonoma State Hospital in Sonoma County. He eventually became Superintendent and Medical Director of the Hospital. He died of a heart attack in February of 1974 at the age of 62. During his time in Japan he developed a deep appreciation for all things Japanese. He collected pottery and prints while in Japan and after moving to Northern California developed a large Japanese garden in his home with a small tea house / art studio and grew and tended over 200 bonsai trees.